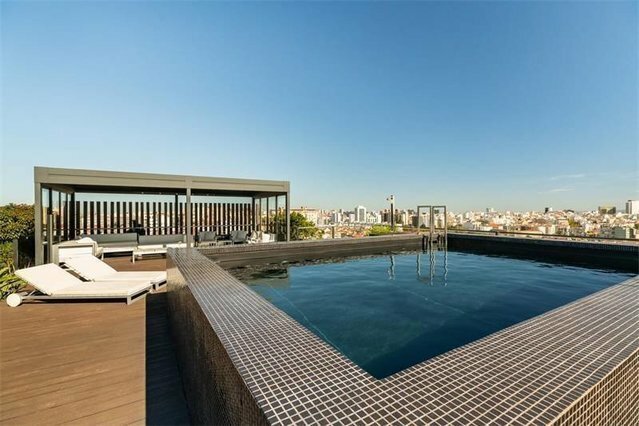 Penthouse apartment with 5 bedrooms near the Praça de Espanha in private condominium. Apartment with three suites and two bedrooms located in the Praça de Espanha with 297sqm of private gross area, two balconies, outdoor space with terrace and private pool. The areas are divided into: - Hall with 13.35sqm - living room with 42.35sqm - dining room with 17.90sqm - fully equipped kitchen with 18sqm - suite with 23.35m2 and closet with 3.6sqm - suite with 22m2 and closet with 4.1sqm - suite with 17.6m2 and closet with 2.4sqm - full bathroom with 3.75sqm - upper terrace with 157.8sqm The whole apartment has excellent finishes, great solar orientation, 5 parking spaces and a storage room. The condo includes 24 hour security, as well as two swimming pools, gym and sauna. Situated close to road access.